An FXp system compatible with the QIAGEN Single-Plate Plasmid DNA Miniprep Wizard. The Biomek FXp Laboratory Automation Workstation is a flexible system that offers major capacity and performance improvements over comparable liquid handling systems. 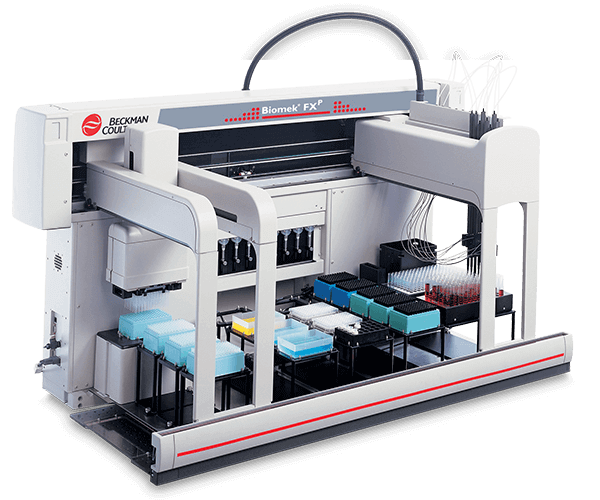 The large deck provides for application-specific functions conducted on Automated Labware Positioners (ALPs) and the differing methodology pods provide the exact tools needed for any application. These tools--combined with powerful system software--are both intuitive and intelligent. The Biomek FXp is the solutions-based platform for any application with far-reaching flexibility.